Conditional Knockout Mice | Knockout Mice | Service | Price | Cyagen US Inc.
Get Your Conditional Knockout & Knockin Mice in as Fast as 6 Months! (1) A super competent ES cell line that generates 100% ESC-derived founder mice rather than chimeras, eliminating the need to screen for germline transmission. (2) A selection cassette on the targeting construct capable of removing itself after ES cell targeting without the need to breed to Flp deleter mice. These innovations eliminate two generations of breeding, shortening production time by 4-6 months as compared to industry standard. For conditional knockouts, it may be possible to breed founders directly to your tissue-specific Cre mice. All projects are backed by our full money-back guarantee – no animals, no charge! Analyze relevant information for your target gene, including gene structure, neighboring genes at the genomic locus, known targeted animal models, etc. Develop a gene targeting strategy, including the method for screening targeted ES cells by PCR and confirmation by Southern blot. Propose the strategy to you for review and approval. 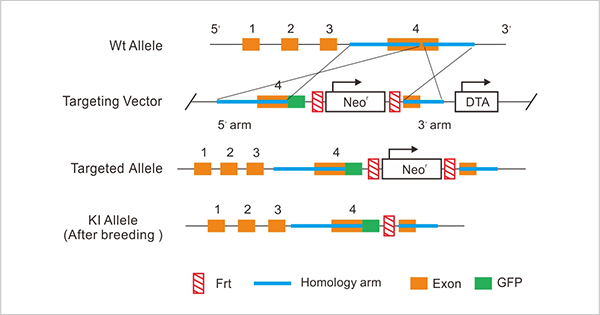 Clone relevant DNA fragments corresponding to homology arms into the targeting vector. Confirm construction of the final targeting vector by restriction digest and sequencing. Electroporate targeting vector into our super competent TurboKnockout® ES cells, followed by appropriate drug selection and isolation of drug-resistant clones. Our ES cells are derived from the C57BL/6 strain. Screen for targeted ES cell clones by PCR. Expand up to six PCR-positive clones, which are further confirmed by Southern blot. Karyotype ES cells to ensure correct chromosome number. Introduce targeted ES cells into host embryos, followed by transfer into surrogate mothers. The resulting TurboKnockout® heterozygous mutants are 100% derived from the injected ES cells. We will aim to generate a minimum of 3 mice. Genotype founders by PCR to confirm their mutant status. Delivery of mice to the customer. In conventional knockout models, one or more critical exons of the target gene are replaced with a drug-selection cassette. This results in the permanent inactivation of the target gene in all cells of the body throughout development. In conditional knockout models, one or more critical exons of the target gene are flanked by LoxP sequences which can be recognized by Cre recombinase. By breeding these floxed mice (mice with gene locus flanked by LoxP) with tissue-specific Cre-expressing mice (Cre deleters), it is possible to specifically delete the floxed region and inactivate the gene in desired tissues, while in all other tissues, the target gene remains functional. - Reporter knockin: A visually detectable marker gene (such as GFP or lacZ) is knocked into a gene locus to replace the coding sequence of the target gene for the purpose of monitoring the promoter activity of the gene. Alternatively, a marker or an epitope tag can be knocked into the end (or less frequently, the beginning) of the coding sequence to form a fusion protein, which allows target gene expression and localization/trafficking to be examined. - Point mutation knockin: By introducing point mutation(s) into homology arms or the targeting vector, desired mutation(s) can be incorporated into the target gene. The mutated gene is expressed under the control of the wildtype gene regulatory elements. - Humanized mouse: A humanized mouse is defined as a mouse model in which a portion or the full mouse gene sequence has been replaced by its human counterpart. The human gene is expressed under the control of the wildtype mouse regulatory sequences. - ROSA26 knockin: ROSA26 is a locus that has been widely used for achieving global expression of the introduced gene in mice. The gene of interest is targeted into the first intron of this locus. The expression of the gene can be driven by the endogenous ROSA26 promoter or by a promoter of choice that is targeted into the locus along with the gene. * You can choose to receive F0 founder animals and perform their own breeding to F1 mice. To ensure the successful generation of F1 mice and germline transmission, breeding of F0 animals require adherence to Turboknockout® breeding protocol, which will be supplied to you. You can also choose to have Cyagen perform F1 breeding, which adds 1-3 months to the projected turnaround time. You can choose to breed F0 founders to wildtype mice or to other stains such as Cre deleter strains of your choice; additional service fees may apply. Note: For special knockout/knockin services not listed above, please inquire about availability and pricing. The turnaround time above does not include the time for obtaining host institution’s approval for mouse importation and transit time during shipping. If you find another service provider that offers better pricing than ours, we will match the price plus an additional 5% off. Standard payment terms include a 50% upfront payment before the project begins, and the remaining 50% plus shipping paid after completion of the project. If you need us to design your targeting strategy, we will provide this service for free irrespective of whether you end up choosing us for your project (other companies typically charge a few thousand dollars for this service). We offer up to a 10% bulk discount for large orders. Large orders are defined as 5 or more projects from the same institution. If you bundle your orders with those of your colleagues, you can all qualify for the bulk discount. Products are shipped from our Santa Clara, California facility. For mouse shipments, the shipping charge includes courier cost plus a $100/crate handling fee. Cells are shipped on dry ice, and the charge includes courier cost plus a $45 handling fee. DNA constructs are shipped in E. coli at room temperature, and the charge includes courier cost plus a $10 handling fee. We typically use World Courier to ship live mice and FedEx for other shipments. Sensing of viral and endogenous RNA by ZBP1/DAI induces necroptosis. Nucleic acids are potent triggers for innate immunity. Double‐stranded DNA and RNAadopt different helical conformations, including the unusual Z‐conformation. Z‐DNA/RNA is recognised by Z‐binding domains (ZBDs), which are present in proteins implicated in antiviral immunity. These include ZBP1 (also known as DAI or DLM‐1), which induces necroptosis, an inflammatory form of cell death. Using reconstitution and knock‐in models, we report that mutation of key amino acids involved in Z‐DNA/RNA binding in ZBP1's ZBDs prevented necroptosis upon infection with mouse cytomegalovirus. Induction of cell death was cell autonomous and required RNAsynthesis but not viral DNA replication. Accordingly, ZBP1 directly bound to RNA via its ZBDs. Intact ZBP1‐ZBDs were also required for necroptosis triggered by ectopic expression of ZBP1 and caspase blockade, and ZBP1 cross‐linked to endogenous RNA. These observations show that Z‐RNA may constitute a molecular pattern that induces inflammatory cell death upon sensing by ZBP1. Follow this link if you are looking for CRISPR knockout mouse model or customized mouse model.